VIDEO: Thunder vs. Warriors Game 2 Full Highlights - 2016 NBA Western Conference Finals - Balita Boss! The Golden State Warriors have defeated the Oklahoma City Thunder in game 2 of the 2016 NBA Western Conference Finals, 118-91. 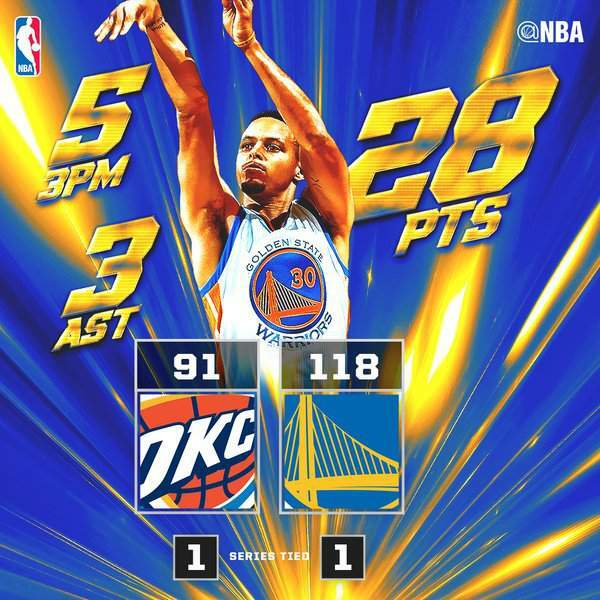 Stephen Curry and the Warriors surged in the third quarter to put away the Thunder and even the series at 1-1. The back-to-back MVP scored 17 points in the third quarter alone, who finished with 28 points on 9-15 shooting. Klay Thompson added 15 points. Golden State also got productive minutes from Andre Iguodala (14 points), Marreese Speights (13 points) and Festus Ezeli (12 points). The Thunder were led by Kevin Durant with 29 points on 11-18 shooting, but committed 8 turnovers. Russell Westbrook was ineffective for most of the game shooting only 5-14 from the field. He finished the game with 16 points and 12 assists. The series is now tied at 1-1 and heads to Oklahoma City for game 3.